Years of experiments on various types of high-temperature (high-Tc) superconductors—materials that offer hope for energy-saving applications such as zero-loss electrical power lines—have turned up an amazing array of complex behaviors among the electrons that in some instances pair up to carry current with no resistance, and in others stop the flow of current in its tracks. The variety of these exotic electronic phenomena is a key reason it has been so hard to identify unifying concepts to explain why high-Tc superconductivity occurs in these promising materials. 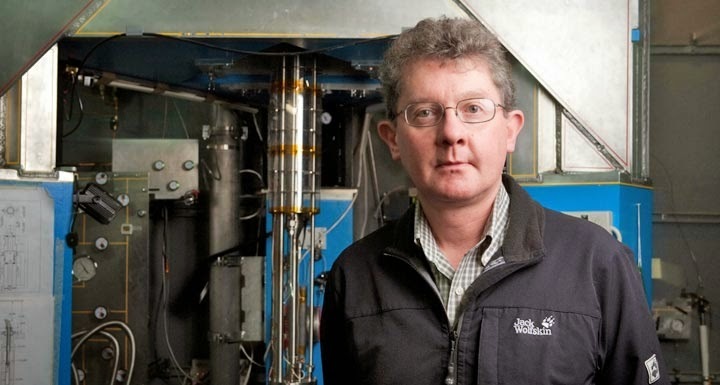 Now Séamus Davis, a physicist who's conducted experiments on many of these materials at the U.S. Department of Energy's (DOE) Brookhaven National Laboratory and Cornell University, and Dung-Hai Lee, a theorist at DOE's Lawrence Berkeley National Laboratory and the University of California, Berkeley, postulate a set of key principles for understanding the superconductivity and the variety of "intertwined" electronic phenomena that applies to all the families of high-Tc superconductors. They describe these general concepts in a paper published in the Proceedings of the National Academy of Sciences October 10, 2013. "If we are right, this is kind of the 'light at the end of the tunnel' point," said Davis. "After decades of wondering which are the key things we need to understand high-Tc superconductivity and which are the peripheral things, we think we have identified what the essential elements are." Said Lee, "The next step is to be able to predict which other materials will have these essential elements that will drive high Tc superconductivity—and that ability is still under development." In all known types of high-Tc superconductors—copper-based (cuprate), iron-based, and so-called heavy fermion compounds—superconductivity emerges from the "extinction" of antiferromagnetism, the ordered arrangement of electrons on adjacent atoms having anti-aligned spin directions. Electrons arrayed like tiny magnets in this alternating spin pattern are at their lowest energy state, but this antiferromagnetic order is not beneficial to superconductivity. However if the interactions between electrons that cause antiferromagnetic order can be maintained while the actual order itself is prevented, then superconductivity can appear. "In this situation, whenever one electron approaches another electron, it tries to anti-align its magnetic state," Davis said. Even if the electrons never achieve antiferromagnetic order, these antiferromagnetic interactions exert the dominant influence on the behavior of the material. "This antiferromagnetic influence is universal across all these types of materials," Davis said. Many scientists have proposed that these antiferromagnetic interactions play a role in the ability of electrons to eventually pair up with anti-aligned spins—a condition necessary for them to carry current with no resistance. The complicating factor has been the existence of many different types of "intertwined" electronic phases that also emerge in the different types of high-Tc superconductors—sometimes appearing to compete with superconductivity and sometimes coexisting with it. In the cuprates, for example, regions of antiferromagnetic alignment can alternate with "holes" (vacancies formerly occupied by electrons), giving these materials a "striped" pattern of charge density waves. In some instances this striped phase can be disrupted by another phase that results in distortions of the stripes. In iron-based superconductors, Davis' experiments revealed a nematic liquid-crystal-like phase. And in the heavy fermion superconductors, other exotic electronic states occur. "When so many intertwined phases were discovered in the cuprates, I was strongly discouraged because I thought, 'How are we going to understand all these phases?'" said Lee. But after the discovery of the iron-based superconductors about five years ago, and their similarities with the cuprates, Lee began to believe there must be some common factor. "Séamus was thinking along a similar line experimentally," he said. In the current paper, Davis and Lee propose and demonstrate within a simple model that antiferromagnetic electron interactions can drive both superconductivity and the various intertwined phases across different families of high-Tc superconductors. These intertwined phases and the emergence of superconductivity, they say, can be explained by how the antiferromagnetic influence interacts with another variable in their theoretical description, namely the "Fermi surface topology." "The Fermi surface is a property of all metals and provides a 'fingerprint' of the specific arrangements of electrons that are free to move that is characteristic of each compound," Davis said. "It is controlled by how many electrons are in the crystal, and by the symmetry of the crystal, among other things, so it is quite different in different materials." The theory developed by Lee incorporates the overarching antiferromagnetic electron interactions and the known differences in Fermi surface from material to material. Using calculations to "dial up" the strength of the magnetic interactions or vary the Fermi surface characteristics, the theory can predict the types of electronic phases that should emerge up to and including the superconductivity for all those different conditions. "The basic assumption of our theory is that when we rip away all the complicated intertwined phases, underneath there is an ordinary metal," said Lee. "It is the antiferromagnetic interactions in this metal that make the electrons want to form the various states. The complex behavior originates from the system fluctuating from one state to another, e.g., from superconductor to charge density waves to nematic order. It is the antiferromagnetic interaction acting on the underlying simple metal that causes all the complexity." "So far this theory has correctly produced all the electronic phases that we have observed in each type of strongly correlated superconductor," Davis said. The next step is to search through new materials and use the theory to identify which should operate in similar ways—and then put them to the test to see if they follow the predictions. "It is one thing to say, 'If we have the key ingredients, then a material is likely to exhibit high Tc superconductivity.' It is quite another thing to know which materials will have these key characteristics,'" Lee said. If the search pays off, it could lead to the identification or development of superconductors that can be used even more effectively than those that are known today—potentially transforming our energy landscape.